The best part of living close to the river is “Madrid Río“, a huge and beautiful park that runs along the bank of Manzanares river where I always find many different options depending on my mood. Whether I want to go jogging or skating or if I just want to relax, take a walk or chat with my friends there are quiet, green spaces perfect for that. But there are also bike paths and skateparks, and it is a very friendly environment so it doesn’t matter if you are a novice or an expert, you are always welcome to join in. 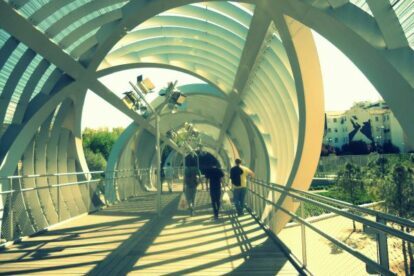 Actually, one of my favourite areas of Madrid Rio are the modern bridges and playgrounds: futuristic, giant slides combined with wooden labyrinths, there’s no way you can’t have fun there! But that’s not all this spot has to offer, if I feel like going to the movies, there is Cineteca (check the Cineteca de Madrid article), an incredible cinema inside the contemporary art center “Matadero de Madrid”. There are three main ways to enter: the North Section by Principe Pio metro station, the Center Section by Marques de Vadillo/Piramides metro station, and the South Section by Legazpi metro station.